Many fitness experts are recommending walking for weight loss and fitness. Walking isn’t effective at burning body fat and if your goal is fat loss you might be wasting your time. I am not saying that walking is not beneficial, I am saying that if fat loss is the primary goal, there are far better choices that will deliver far better results. The primary benefits of walking are increased blood flow and circulation, improved recovery, and a strengthened immune system. 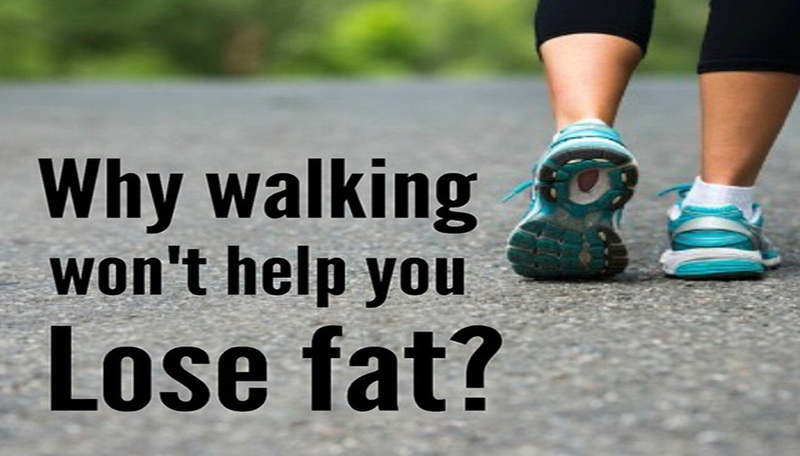 There are several reasons why walking is not the best choice when it comes to fat loss. Here are just a few. Another downside to walking is that because it’s generally low intensity it results in only a small increase in metabolism that will only last approximately 1-2 hours after the walk. On the other hand, metabolism increases are larger and last longer (4-24 hrs or more) when you perform high intensity cardio workouts. .
One reason is that people don’t want to hear that they have to work hard so they figure some activity is better than none. Another reason is that the body burns more fat for fuel when exercising at an easy pace, however, the total amount of energy used is so small that you end up burning off little body fat. That’s also why when you choose the “fat burning” program on your treadmill or bike it has you exercise at an easy level. Yes, you’re burning fat, but so little that you’d have to exercise at that easy pace for hours and hours each day. High intensity cardiovascular/aerobic exercise is much more effective in burning off the excess body fat. Compare the bodies of a walker, marathon runner, and sprinter. A sprinters body is very muscular and has little body fat while on the other hand the body of a walker will likely have the opposite, little muscle and more fat.